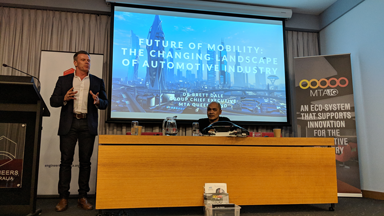 This week MTA Queensland CEO Dr. Brett Dale presented on the topic of disruptive technologies that Queensland based innovators are working on, which could dramatically change our mobility options in the future. Hosted by Engineers Australia, the presentation shared the innovation journey of MTA Queensland and the evolution of MTAiQ established in 2017; providing an eco-system that supports innovation in the motor trades. Instrumental in the development of MTAiQ, Brett’s contribution to the country’s first Automotive Innovation Hub has led to the creation of Queensland-based company NXG3N Robotics: developers of an electric-powered autonomous flying car. The flying autonomous looks like a car and that can fit into a garage, driveway, a space at a shopping centre car park, and the lives of future Australians. It has a modular and uniquely adaptable design allowing elements to be replaced with ease, simplifying the assembly line as well as future maintenance and upgrades. Brett’s presentation discussed the State’s leading innovations including an innovative fuel purchasing platform called Refueler and a self-driving shuttle called Olli. Brett touched on the future of the automotive industry and the technological disruption to come emphasising the need to prepare for change now. Nathan Nguyen, Community Manager for MTAiQ, shared the inspiring journey of the Pegasus Flying Car project, which is continuing to evolve in the MTAiQ innovation hub.